At midnight, we abandoned the car on Fox Rd. and prepared to hike our way to our house, a mile down MacArthur. As the remnants of Irene blew through the mountains, I tensed with each gust of wind. “Walk in the middle of the road!” I called out to the boys, for fear they’d be hit by trees or trip into flood-carved caverns on each side of the road. Each of us carried a pack of essentials–things we didn’t want left in the car, and things we needed once we were home. There were also two flashlights, clever wind up ones, that were also solar powered–purchased conscientiously by my husband with our neglected LL Bean coupons. The light flickered on and off, obscuring the view of the road when we most needed it to avoid falling into pits or tripping over debris. We begged each other to take turns winding to give our aching arms a break, as there had been no sun in our glove compartment to charge them. I silently cursed my husband for not being a boyscout, and equally questioned how I had gender assigned responsibility for our safety. As we carefully made our footing down MacArthur, we looked for any signs of power in the handful of homes that scattered this steep rural road, but not a flicker of light was seen. Had we been home before the storm, we would have taken the necessary precautions–namely filling the tub with water to flush the toilets, and filling other jugs for washing dishes and drinking. My husband did fill our large water cooler and left it in the basement before we left for the beach; but hurricanes rarely affected us here in this landlocked state, and this was just a precaution. It seemed crazy to leave the protection of the mountains with a hurricane coming up the coast, but we had already arranged the house trade, and preparations for the wedding that our house guests were attending were already in full swing across the pond at Neringa Camp. It was the mother of the bride who had arranged the exchange, and we rode out the hurricane at her house in Cohasett, Massachusetts. I sat on the screened in porch while the wind whipped through the town, and jotted down this little ditty after sketching the trunk of the hundred year old beech on her front lawn. The next morning we woke without power, and yet there was little word of anything serious in Vermont so we began packing to leave. I would have preferred to wait until morning, but my husband had a school inservice the next day, and the winds had died down enough that it was now safe to travel. Our three hour drive to Vermont was non-eventful and just as we got into the state, my husband stopped to use the restroom at the Welcome Center on 91. I was annoyed at this delay, just 30 minutes from our house, but he said he couldn’t wait, and so I passed the time using the internet. It was then that I began to read first-hand accounts of the storms effects in Southern Vermont. 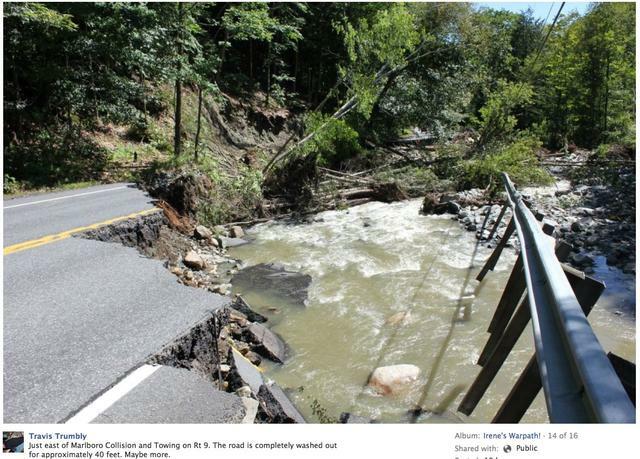 One by one, Facebook posts told of the flooding in Brattleboro and of the closing of Route 9. 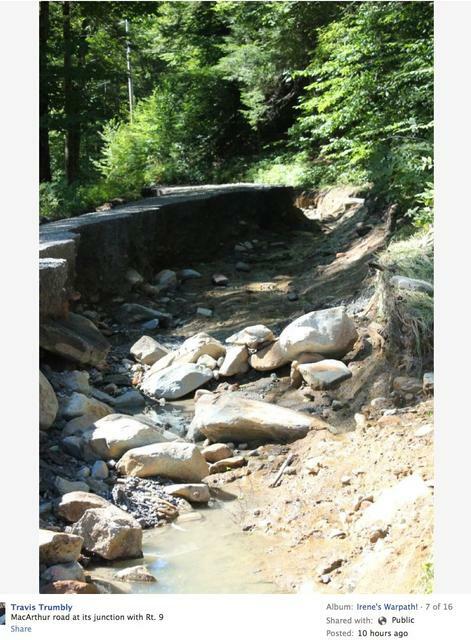 I put a post up myself to see if how the back roads were, and was alarmed to hear that many bridges had flooded. To play it safe, we called a few area hotels so that we could finish our trip home in the light of day, but everything was full or flooded. My sister in Brattleboro offered her floor, but we weren’t sure we could even get there, and we had a car full of boys–my own two, and a teenage friend. If things were really this bad, we’d rather be home in Marlboro than stranded in town. A state policemen pulled up beside us in the parking lot of the Welcome Center, and we asked what he knew, but he knew less that what we discovered through friends on Facebook. We considered heading to a shelter. Instead, we made the decision to head home. We pieced together a backroads route from FB posts, and made our way toward Marlboro via Guilford, bypassing much of Brattleboro. So far so good. The roads were wet, but paved and sturdy. When we finally made it passed Lilac Ridge Farm to Ames Hill–a dirt road that runs parallel to the highway that had been closed–we came across a huddle of emergency vehicles and men on ATV’s. A rescue mission was in progress for folks stuck on Stark Road–just across from our own. They wouldn’t let us proceed because they didn’t want us getting in the way with their operation. We reconsidered trying to make it to my sister’s, or to a shelter–if there was any–and once again, we decided on home. About an hour passed before the men returned, and they told us that Ames Hill was passale–with four-wheel drive and high clearance. “It’s touch and go,” they warned. Without giving it another thought, or asking my opinion, my husband jumped back behind the wheel of our Honda Civic; and soon, there was no turning back, for that would have been more treacherous than continuing. At Robb Hill Farm, a car like ours sat sideways teetering on the brink of a cavernous hole where once the road had been. The car was empty, and we continued, stopping when needed for the boys to remove large rocks and to the lighten our load so that we could make it over ditches. Each time they stepped into the dark, my stomach clenched for fear that they would fall into what should have belonged in a nightmare–roads eaten away by water, leaving only a narrow, rugged path for our car. There were many such moments like this, but we were never in real danger, though more than once I worried that we could become one of those tragic stories dismissed by others for being stupid. Why did that family try to get home, they’d say. We didn’t know what we would find once we got there either. Would there still be a driveway? Would our house be flooded? Would the guests still be there, with no where to go? On Facebook, I had read that Neringa pond had been flooded, and that the wedding guests were now stranded because the bridge had washed out, but we could see little of this in the dark, and we were eager to get to our own home. There were no lights to welcome us, but we could make out no damage either, not even on our steep driveway. The neighbor’s jeep was there, and our friend’s truck, but inside the house was empty, and we lit candles and brought out the reserved water, and headed up for bed. It had taken us over three hours to get home from Brattleboro which is typically a 15 to 20 minute drive, and I was weary from worry. In fact, I worried all weekend when my hometown at the Jersey Shore evacuated. I never expected that we, in Vermont, would be harder hit than they. I brushed my teeth with the water from the car, and then asked the boys to do the same. When my teenage son said that he had left his toothbrush in the car, I was livid. Fuming, I rustled through the drawers to find an extra tooth-brush by candlelight. “Mom, just forget about it,” my son said, irritated by my urgency. I took a deep breath and wondered the same thing. “I know,” he softened, and so did I, and we hugged each other good night, with clean teeth. 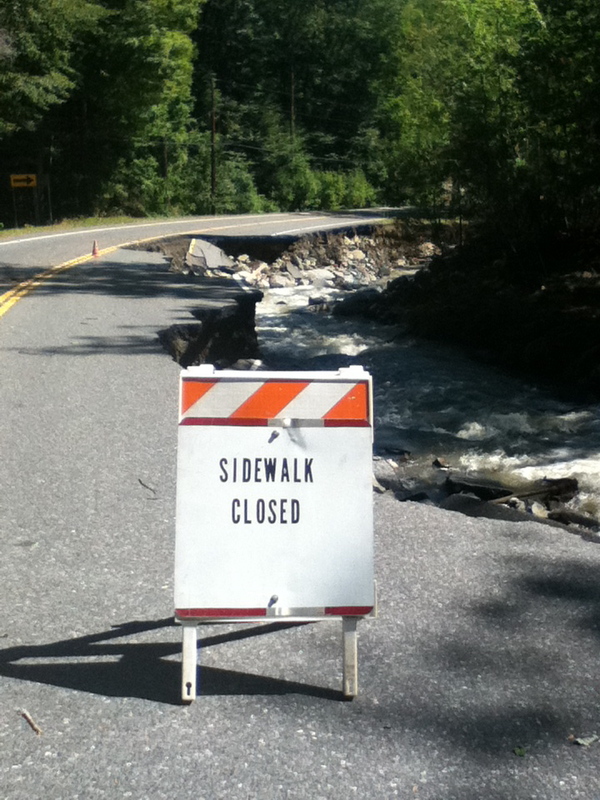 For more about Irene in Vermont, click here. If only I could write a tribute to roads like Langston Hughes bestowed upon rivers, but there’s no poetry in me this week, and none like his. That anything could wash away thoughts of murder inside the Co-op is unfathomable, until now. Until Irene. On the morning after she hit our unsuspecting mountaintop town, I ran down my driveway toward Neringa Pond. There I found clusters of neighbors in sober conversation, and passed them without a word, continuing toward the mangled dock that crossed the pond where I discovered that the dam was surprisingly holding steady. I continued down the road alone until I came to the bridge that crossed over to Camp Neringa and saw that in its place was a gaping span of… nothing. These wedding guests had flown in from Toronto, and others from California, while one had come from as far as Lithuania. We shouted some more across the roar of the Whetstone–about food and generators and water (all of which they had)–before turning our backs on one another on opposite sides of what had once been connected. I held back tears as I continued down MacArthur Road where I came across more neighbors helping one another over the gaping pits where sections of our road once stood. At the bottom of the hill, the underbelly of MacArthur was completely exposed–revealing gravel and dirt and a culvert many times my size. With hesitation, I leaped over it to make my way toward the Route 9. 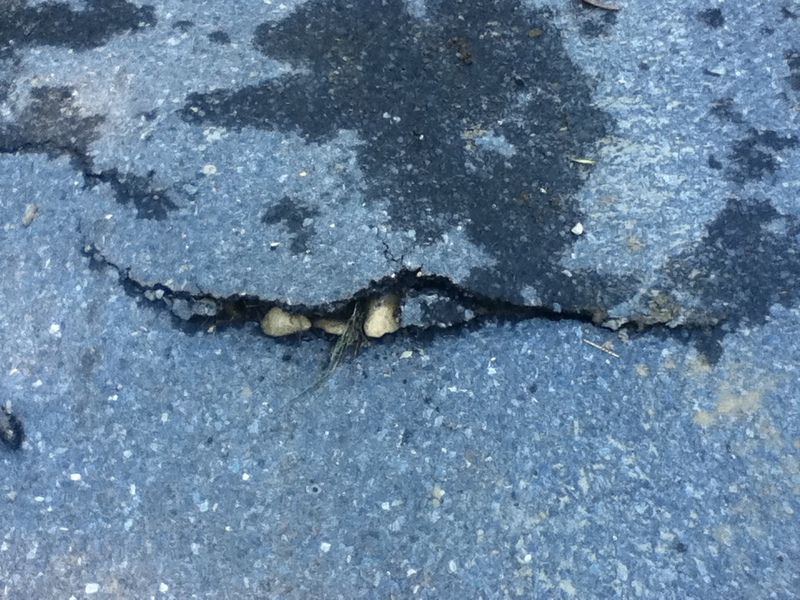 MacArthur Road, photo from Catherine Hamilton, August 2011. I’ve written about the highway that crosses Southern Vermont before, about the lives its mountainous curves stole from our community—a dear friend in her twilight years, the 21-year-old nephew of the kindergarten teacher, and an 8 year-old peer of my son’s from a neighboring town. Typically teaming with travelers, Route 9 was barren this morning, and eerily so; so clear of traffic that I could lie down in the middle of the highway and have a photo snapped of me there. Instead I continued up it, past the hill where young Kayla died, and without any specific destination in mind. I’d never walked along Route 9 before, at least not with such an unsettling sense of safety, and I couldn’t stop. For awhile, it was only me and the butterflies up a road where vehicles fly by at 50 or 60 miles an hour. At the crest of another hill, I passed a man coming the other way with a wax bag in his hand. “Sweeties isn’t actually open, is it!” I asked, and he nodded his head, and kept walking. A half-mile later, I stood inside the darkened store, relieved to see Michaela, a graduate of Marlboro College, attempting to make coffee and sandwiches for the community; and Ashleigh, a Brattleboro Highschool student, arriving to work by some heroic effort of her mother; and Rose, a town official, bending over a large map, helping travelers find routes home should any open. I passed other explorers on my way back down Route 9, and when I arrived back at the intersection of MacArthur, it was crowded. A mini-van had been abandoned there during the night, atop a pile of rocks and trees, and someone said that it had been a traveler caught up in debris when the Whetstone Brook took the road and turned Route 9 into a grander expression of itself, rushing east toward Brattleboro. By now, the sun had risen on the day, and although I was overdressed for the coming heat and unprepared for such a trek as I had already taken, I found myself passing MacArthur by, and continuing east on Route 9, to see what others had described as indescribable. 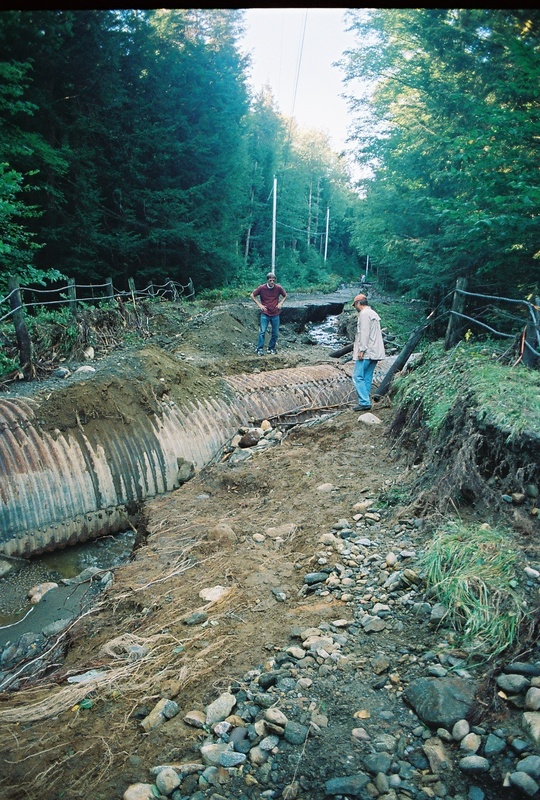 There at the edge of town, about a mile further down the highway, I approached Steve’s Auto Body Shop where half of Route 9 had neatly collapsed, right at the yellow line, into the rushing stream that didn’t used to be there below. No sign was needed for what lie just passed Steve’s. It was a destination so awe-inspiring that it had attracted elders and mothers with baby carriages for what was sure the most apocalyptic view of this flood’s devastation. And if they still looked dubious, I would explain that even if they could, by some miraculous Evil-Knieval feat, daredevil their way across what many called the Grand Canyon, they would find similar canyons all along Route 9 heading east into Brattleboro–each with ten to twenty-foot pits below. “Not even the National Guard, on a rescue mission, with tires bigger than your car, could get through last night.” I’d say. Similarly, the roads heading West into Wilmington were closed, and those in the north, and in every direction; so that these drivers turned around, one by one, resigned to being stuck like the rest of us. Some slept at the church or at the Inn or inside their cars, I suspect. By the time I hiked back up to my house, the boys were awake and ready to do some of their own exploring. Their father took them out while I went upstairs to lie down, drifting into the sweetest, exhausted reverie I have ever known until the sound of a helicopter circling my home, not once, but three times, brought me to standing as I heard it land across the pond to sounds of cheers. 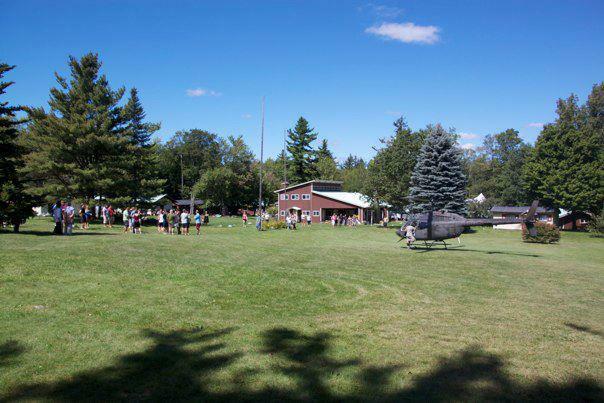 I jumped up then and dashed out my door to make my way over the mangled dock, and up the path to Neringa’s field where I came across 100 wedding guests huddled together as the chopper lifted back into the sky. And then I returned home once again, and slipped out of my clothes, and into bed, and slept–for the rest of the day–stirring now and again to the sound of more aircraft—the Red Cross, the governor, the National Guard—only to let my head drop heavily back on the pillow in what felt like a drugged stupor. The air was crisp, the sky beautiful, and my home–and even my steep driveway–uncannily untouched by the devastation that was all around me. From under my covers, the world was more tranquil than ever. There were no cars passing on MacArthur and no whine of 18 wheelers from Route 9. The house was silent too–absent of the hum of appliances or the ringing of phones. I couldn’t bear to think about how long we’d be without power or how much it would take to repair these roads or how hard others may have been hit, and so I slept as long as I could. The sublime quiet brought me back to the days after 9/11–when our skies were as empty as our roads were now. In my 47 years, I’ve known roads—mud strewn ones and flooded ones—empty ones and crowded ones–worn ones and brand new ones–but I’d never known anything like today. My soul has grown deep with our roads, deeper than I ever knew. 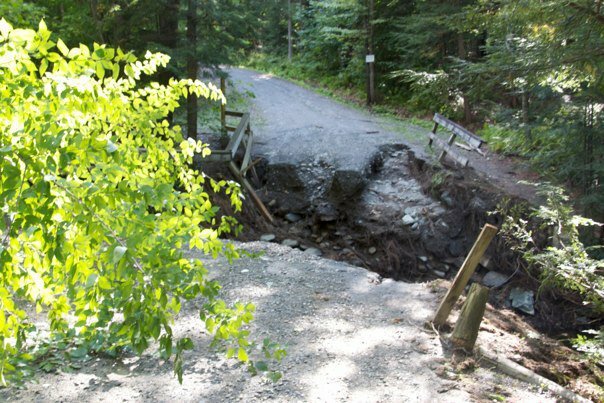 Click here for more on Vermont and roads and the history of this place we call home, by road namesake, Robin MacArthur.